(Mens M) Ugly Xmas Sweatshirt! Snoopy & Woodstock Build a Charlie Brown Snowman! Home > Ugly Christmas Sweaters > Ugly Christmas Sweatshirts > (Mens M) Ugly Xmas Sweatshirt! Snoopy & Woodstock Build a Charlie Brown Snowman! Vintage ugly Christmas sweatshirt! 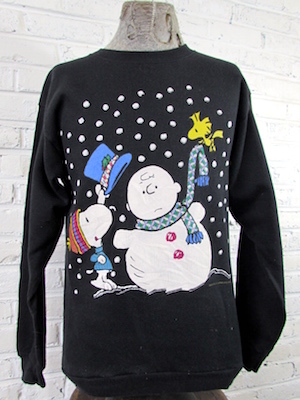 A fun holiday sweatshirt featuring Snoopy and Woodstock finishing off a Charlie Brown snowman with a top hat and a scarf! Behind the Peanuts friends there are big white snowflakes outlined with silver glitter. Sweatshirt has a black base. A fun holiday sweatshirt for any Peanuts fan! Tagged by Peanuts. 100% Acrylic. Condition: Very Good. Has some cracking in the image. Does not detract from the awesomeness of this sweater! Sleeves: 30.5" collar to cuff.